FlexNow Review – Is This Product Safe To Use? FlexNow is a joint pain medication which targets the inflammation that leads to swelling, stiffness and immobility. The official website for the product is very detailed but not overall user-friendly. Many of the sections are poorly labeled, hard to navigate and repetitive. Apart from this, it is very informative, not only about the FlexNow brand but also regarding the causes and symptoms of joint pain, which can occur from sporting injuries, aging or a disease such as arthritis or rheumatism. In addition to the product information, the website offers a lengthy FAQ section and numerous customer testimonials. The general tone of the site is not gimmicky and the product is not presented in a ‘too good to be true’ manner. The results of several clinical studies performed on FlexNow are provided as is the list of ingredients. FlexNow is available to order directly from the manufacturer’s site and is also sold in retail stores which allows for some competitive pricing. Unfortunately, no free samples of FlexNow are offered and there does not seem to be any money back guarantees. What is guaranteed however is the quality of the ingredients and the safety standards of the manufacturing facilities. 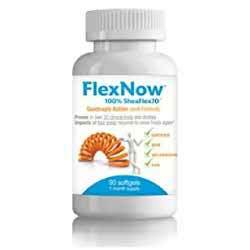 FlexNow is a very simple product which works by using only one active ingredient, SheaFlex 70. As explained in detail on the website, this ingredient is sourced from the West African Shea tree and is a sustainable, natural product. Shea is probably most commonly known as an ingredient used as a moisturizer in beauty creams, whereas in FlexNow the Shea nut is processed in a way that isolates one particular substance, triterpenes. Sometimes called ‘nature’s steroids’, triterpenes help inhibit the protein cytokine, a protein that controls immune response and inflammation. While some inflammation is normal, by inhibiting cytokines, the process is reduced meaning pain is less intense. In addition to this, FlexNow helps to rebuild cartilage and collagen, making the whole joint stronger and able to withstand shock and potential damage. While SheaFlex 70 is the only active ingredient, the FlexNow capsule is made from gelatin, making it unsuitable for vegetarians. However, because the Shea ‘nut’ is actually the pit of the fruit, it is safe for anyone with nut allergies. The dosage for FlexNow is for three capsules to be taken at any time of the day, either with food or without. As with most pain medications, FlexNow takes a while to reach its full potential, which is usually within 2-3 weeks. What are the Pros of FlexNow? What are the Cons of FlexNow? The use of SheaFlex 70 makes the product unique among other joint pain medications and is a good alternative to the commonly used Glucosamine/ Chondroitin combination, which is unsuitable for anyone with shellfish allergies. It must be remembered though that once it has reached its full potential, it must be taken continuously to maintain the performance and to ensure a reduction of inflammation and pain. However, there are plenty of options available in the market which might offer more benefits than this product. Explore such products before buying this product.